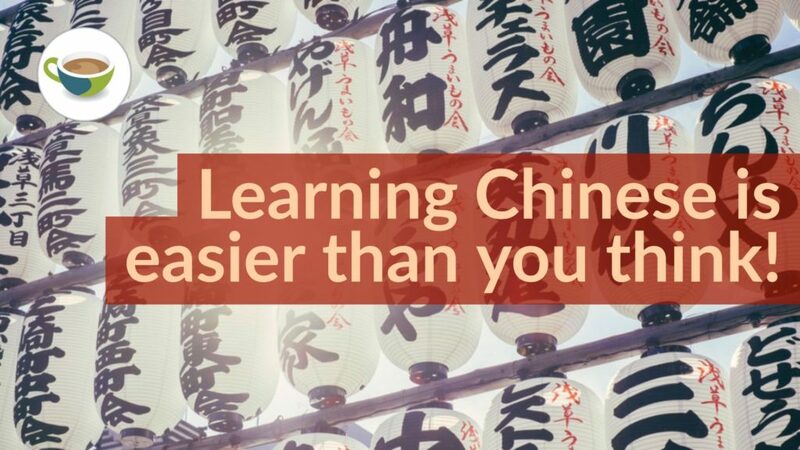 Learning Chinese is easier than you think! Have you ever wished you could speak Chinese but you’re put off by the difficulty? We often hear people, particularly in the West, say “Chinese is the most difficult language in the world”. People are often frightened by the seemingly complicated characters, the foreign quality of the sounds, and the speed at which native speakers appear to speak. But is it simply the fear of the unknown that is holding you back? We’re going to take a look at the two most daunting aspects of Chinese, characters and pronunciation. You’ll see that broken down, these aspects are a lot easier to learn than you may think. It’s likely that your first experience with a foreign language may be a language like French, German or Spanish, which uses a Latin script, just like English. Therefore, when you see a phrase like “三个中国人”, the complicated appearance of the script itself seems unfathomable! How will you know how to pronounce it? How can you learn a language with no alphabet? How can you remember all those characters? Well, let’s see why Chinese characters are a lot more logical than they may appear. 木 mù means “tree”. Quite easy to visualise, right? You would have to learn these words individually, and learn how to spell them. If spelling isn’t your forte, Chinese is the language for you! Many characters are also ideograms: they represent not something physical like a tree, but an idea. For example, the characters 一 yī, 二 èr, and 三 sān are abstract representations of the numbers one, two and three. Abstract ideas are often represented through radicals. A radical is a small part of the character which tells you something about the meaning of the word. For example, the 口radical (meaning mouth) often features in characters which relate to eating. Meaning – there are 214 radicals in Chinese, which can tell us something about the meaning of a character such as: it’s made of wood, it’s related to water, it’s tall. Once you’ve learned some words which contain these radicals, it will get much easier to guess the meaning of a word by looking at the character. For example, most body parts contain the radical 月, like these: 腰 yāo (waist), 腿 tuĭ (leg), 脚 jiăo (foot). Pronunciation – Once you know a few characters, you can often guess the pronunciation of a word because the characters have similar elements. For example, take 爸 bā meaning father and 把 bă meaning to hold. Both contain the 巴 component which tells you that it is pronounced ba. Distinctive particle – A character may also contain an “empty component” which has the sole function of distinguishing it from other characters. You’ll be glad to know that characters are the hardest part of Chinese! Yet hopefully now you can see that it’s not all squiggly lines and pictures: the system is logical when you get used to it. Remember our phrase from earlier? “三个中国人” Perhaps it is a little less daunting now. It actually means “three Chinese people”. 三 sān is an ideogram, it means three. 个 ge is a measure word, which often follows numbers. This character is really useful. If you see it, you know that something is being counted. 中 zhōng means middle. As you can see, it is a rectangle with a line down the middle, so it is super easy to remember! 国 guó means country. It is a compound character made up of 囗 wéi, a radical indicating enclosure and 玉 yù, a component which represents the Emperor. Therefore, this character represents country or nation, defined by an enclosed area which is ruled or governed. Pretty cool right? For historical reasons, China is known as 中国 Zhōngguó, the middle kingdom. Most country names contain the character 国 guó e.g. 英国 Yīngguó (United Kingdom), 法国Făguó (France), 美国 Mĕiguó (United States of America). 人 rén means people. Thus, 中国人Zhōngguórén means Chinese person. In English, you can’t say “I am a middle country person”. You must use a completely new word, “Chinese”, to express the concept. Chinese is great for minimising the new words you have to learn! Spanish: Inglés no es fácil. We’ve put the stressed syllables in bold. Did you notice that the Spanish sentence had two accented words? If you’ve studied Spanish you’ll know that if a word doesn’t follow Spanish stress patterns, it needs an accent. Each Chinese syllable is given equal stress, so stress patterns are one less thing to memorise! In fact, most Chinese words have only one syllable anyway – no need to worry about getting tongue tied pronouncing long words! Each syllable is made up of initials and finals (word beginnings and word endings), and once you learn these sounds, you will be able to pronounce any initial and final combination. Throughout this article we’ve been using Chinese characters combined with words written in the “English” alphabet or, to give it its proper name, the Latin alphabet. This method of writing Chinese in the Latin alphabet is called pinyin. Pinyin can help beginners with pronunciation before they have mastered the characters. Pinyin also uses four different “accents” which represent the tones of the language, so this helps you know how to pronounce each word. And the great news is that once you’ve learned all the sounds of pinyin, there are no pronunciation exceptions! For example, the words liáng, biáng, jiáng all have the same finals, therefore they will always be pronounced the same. Compare this to English words like rough, though, and through. Despite appearing to have the same endings, you must learn a different pronunciation for each one! Like any other language, Chinese has its challenges. But if characters and pronunciation are the hardest parts, maybe Chinese isn’t the hardest language in the world after all. Chinese is very simple to learn after the initial hurdles. The hardest part is getting started! And talking of getting started, we have the perfect method to help you learn Chinese: with Coffee Break Chinese you can take your first steps in the language. Now you know it’s far from “the most difficult language in the world”, there’s nothing stopping you! Click here to find out more. What have you found difficult about learning Chinese? Let us know if we’ve helped you conquer your fears by posting a comment below! I was a high school Chinese teacher for some years. I agree with you that lots of students said they thought Chinese is too hard to learn. I simply just tell them, there is no new language easy to learn. All of the skills if you want to be an expert, time is for sure required.